Energetic approaches in yoga: An exploration of the concepts of langhana (relaxing, releasing), brhmana (dynamic, energizing) and samana (balancing), through the play of asana and pranayama in relaxing, stimulating and stabilizing practices. Bandhas: theory and practice in asana and pranayama. This will be a gradual and progressive teaching, through which we will explore varying degrees of intensity as well as alternative practices when these intense “locks” are contra-indicated. Three workshops for Toronto Yoga Festival. National Ballet School, Toronto. Classic poses, their variations and adaptations: how breath and intention shape our experience. Sound and Mantra in asana, pranayama and meditation: Sound is a natural extension of breath which provides ways to deepen yoga practice on all levels. This workshop will include asana practice with breath and sound, enhancing our experience of poses while developing mental focus. We will also explore the use of mantra, both chanted and silent, in pranayama and in meditation. This workshop will give you an opportunity to develop keen listening and an accurate pronunciation of Sanskrit. We will begin with simple sounds and move to mantras and Patanjali’s Yoga Sutras, following the traditional way of teaching, of call and response. Chanting is a fantastic way to develop breath and attention, to embody essential teachings and to find new energy. We will follow principles of Vedic chant, which are both ancient and rigorous, yet freeing and fun. All levels are welcome, from beginners to experienced chanters. Asana and pranayama: delving deeper. In this workshop we will continue exploring the role of breath in asana with a special focus on preparing for advanced pranayama practices to stablize and clear the mind. Yoga of the Bhagavad Gita: This workshop will introduce key teachings from this timeless text and explore their value in today’s world. We will deepen our understanding through practices which include asana, pranayama and meditation. Yoga for the Whole Person: the panca mayas in practice. The five mayas are dimensions of our human system: anna – body; prana – breath; manas – contents of the mind; vijnana – individual personality; ananda – deep emotion. Through discussion and practice we will explore how our connection with the different layers of ourselves can be enhanced through yoga. Change and permanence in yoga: In the Yoga Sutras, Patanjali teaches about change and permanence. As our practice and understanding develops, we gradually find how to influence change in a positive direction, to let go of attachment to what we can’t change and to find peace in what is eternal. Through asana, pranayama, chanting and discussion we’ll examine ways of bringing these teachings into our own lives. Through case studies, group practices and observation, we will explore an approach to yoga therapy which places the individual at the centre of healing and wellness, drawing on all aspects of practice: asana, pranayama, chant and meditation. 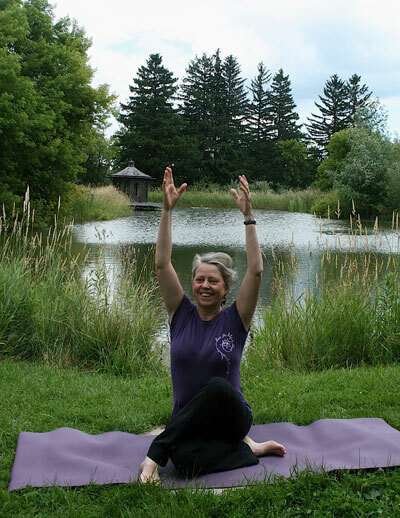 Rosemary Jeanes Antze is the senior Canadian teacher in Desikachar’s lineage. She has recently completed a four-year, case-study based Yoga Therapy program with Claude Marechal, Desikachar’s senior European student. The phrase vinyasa krama suggests moving step-by-step from where we are now towards a goal. In this workshop we will consider this underlying concept and examine techniques of krama in asana and pranayama, and in sequencing an evolving practice. Aspects of prana: the five vayus. We will explore the movement and function of prana – life force – and consider its dimensions, prana, apana, vyana, udana, samana. Practices including asana, pranayama, chant and meditation will deepen our understanding of these teachings. Rosemary is available for invited workshops. Contact rosemary@anaama-yoga.ca.